So, as I was throwing together a pot of chili the other night I figured I’d head this one off at the pass. The kitchen was already kind of a mess, though, and I wasn’t really in the mood for anything that would dirty a million measuring cups (as gluten-free baking can certainly do). We also had a couple lingering ears of corn from our CSA and a can of green chiles that I remembered looking pretty lonely in the pantry. Done and done. It was a quick dump and pour affair. 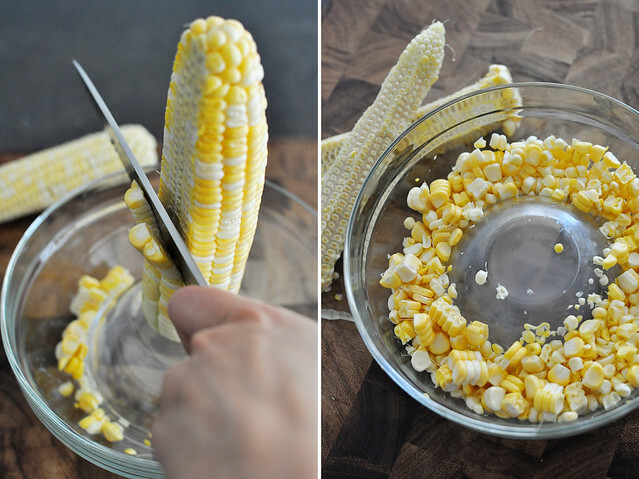 Slicing the kernels from the corn was the most precious thing I did here, and that takes less than a minute per ear (and basically no time if you use frozen kernels). I even went ahead and used water because, per usual, we didn’t have any plant milk on hand. After I mixed it all up, I tossed it in the oven, crossed my fingers, and took the kids for a walk. I arrived home to the smell of chili simmering on the stove and, a few minutes later, a firm cornbread, ever-so-slightly cracked around the edges, emerged from the oven. It looked great. I just hoped it would be edible. Let me tell you, this was a hit! The hubby loved it. The kid loved it. Even I, a person who spends an annoying amount of time dissecting the perfectly good dishes I create and pointing out their flaws, loved it. 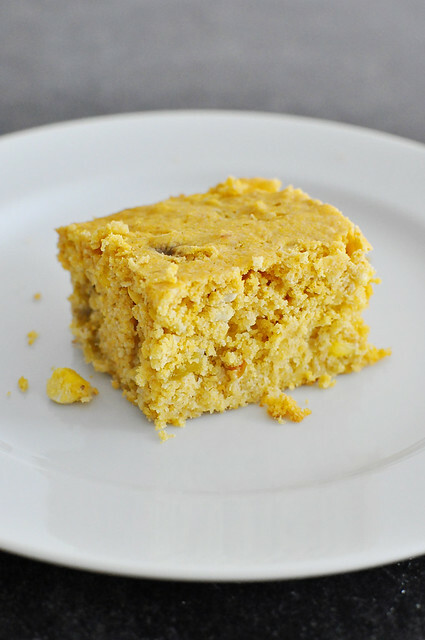 It’s a simple, moist, slightly crumbly cornbread with a light maple sweetness and filled with bright pops of corn kernels. The green chiles add a vegetal savory note that totally works. 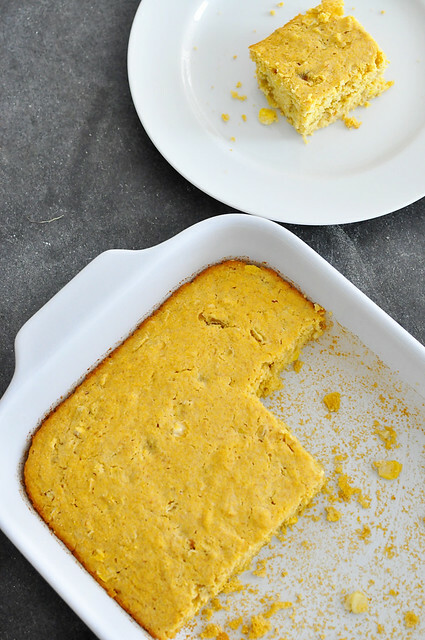 I won’t tell you that this is the last cornbread you’ll ever need, but it definitely belongs in the fall rotation. Heck, it would even work well at the height of summer, sidled up to a savory bowl of raw veggie soup. The (relatively) short ingredients list for this cornbread comes together quickly and is pretty darn wholesome. The taste, however, will still make you feel indulgent for reaching for that second piece. Preheat oven to 350 degrees and line an 11x8" baking dish with parchment paper or brush lightly with oil. Whisk together the flax meal and water in a small bowl. Set aside for about 10 minutes, until a thick gel forms. 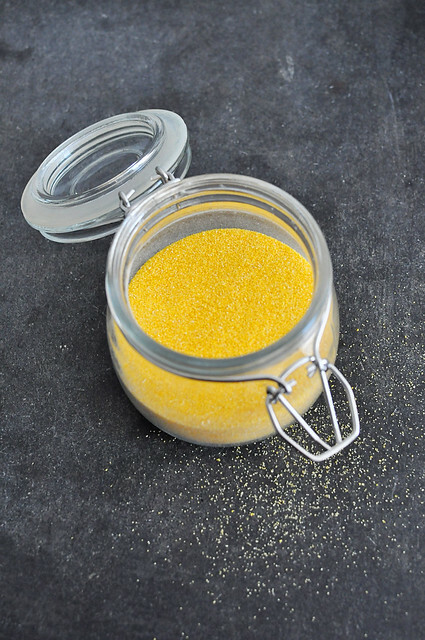 In a large bowl, whisk together the cornmeal, millet flour, baking powder and salt. 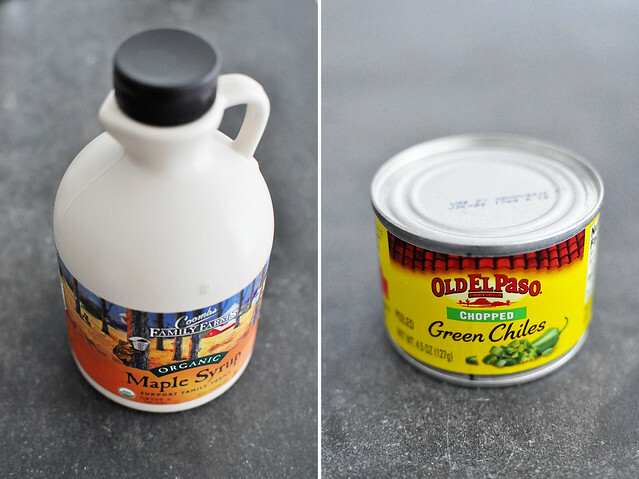 Whisk the maple syrup and applesauce together in a medium bowl. Whisk in the flax gel. Once combined, stir in the plant milk (or water). Pour the wet mixture into the dry mixture and whisk just until smooth. Stir in the corn kernels and green chiles. Transfer the batter to the prepared baking dish and bake for 55-60 minutes, until firm in the middle and lightly golden around the edges. Avril, I am so sorry to hear that it came out dense! I’ve made it a couple times and haven’t had that issue. Is your baking powder fresh? Let me know if you do make it again and still have issues. I’ll definitely keep this in mind next time I make it and see if I need to troubleshoot the recipe at all. Thank you for your feedback!